DOWN ARGENTINE WAY is another of Fox's beautiful candy-colored musicals set in an exotic location. Wealthy horse owners Betty Grable and Don Ameche are instantly smitten with each other, but a family feud threatens to keep them apart. This being a happy 1940 musical, there's little chance their problems will last, and in the meantime we get to enjoy Carmen Miranda, playing herself in her U.S. film debut, as well as the Nicholas Brothers, who perform one of their most exciting routines. The supporting cast also includes Charlotte Greenwood, who would soon thereafter appear with Ameche and Grable in MOON OVER MIAMI, and the marvelous Henry Stephenson, a character actor who was memorable in films such as LITTLE WOMEN (1933) and CAPTAIN BLOOD. As was often the case in Fox movies of this era, the film features gorgeous gowns by Travis Banton; the color, sets, and costumes alone are something to see. The movie is 90 minutes long. DOWN ARGENTINE WAY is available on DVD. Extras include a commentary track and an episode of BIOGRAPHY. The DVD can be purchased individually or as part of the new four-movie Betty Grable Collection. This film is also available on VHS. Light blogging of late, as we are spending lots of time running around collecting things for my daughter's college dorm room. Nothing as excessive as described in the above article...but still, this seems a lot more complicated than when I went off to college. I remember shopping for new bedsheets and getting a plastic plate, bowl, and mug set for snacks. (I still have the bowl!) I received a couple other necessities as graduation gifts. These days you not only have to pick out a laptop, but all the accessories, including a laptop backpack, a surge protector, and a printer. Bringing sheets from home isn't an option, as the dorms have "XL twin" beds instead of regular twin beds. (I'm told some regular twin sheets will fit the XL beds...we're going to test that rumor out.) The rooms come with microwaves, so you need microwave-safe dishes. And the rooms are much smaller than when I was in school, so "storage solutions" (under the bed and over the door) are issues as well. We've been spending a lot of time in Bed, Bath & Beyond and Target... Incidentally, did you know Target has fan blogs devoted to it? We missed "college night" at The Container Store, but we'll probably be checking in there soon as well. Just a couple more weeks till move-in day at USC! Although I'm quite a Disney fan, I don't "do" creepy movies very well, so to date have skipped the PIRATES movies, although my husband and two older children have enjoyed them. After seeing the remodeled Pirates ride at Disneyland twice, curiosity got the better of me, so tonight my teenage daughter showed me a "censored" version of CURSE OF THE BLACK PEARL, fast-forwarding the DVD past some of the spookiest "skeleton" scenes, particularly in the climactic battle. I enjoyed what I saw of the film very much. Lots of wit and derring-do, and a nice musical score. Johnny Depp's Captain Jack Sparrow is a unique character, with a combination of haplessness and skill, so you never quite know what he'll do and whether or not it will work. Depp, Orlando Bloom (a blacksmith who doesn't know his father was a pirate), and Keira Knightley (a governor's daughter who has a secret fascination with pirates) play well off each other as they find themselves entangled together in a series of adventures. The scary parts of the film which I did peek at weren't as bad as I expected, especially with a little strategic fast-forwarding , and the best parts of the movie were very good indeed, with the swordplay, humor, and romance calling to mind Errol Flynn movies. PIRATES OF THE CARIBBEAN is available on DVD. Among the many extras are a terrific segment from the WONDERFUL WORLD OF DISNEY showing the opening day of the Pirates of the Caribbean ride at Disneyland in 1967. 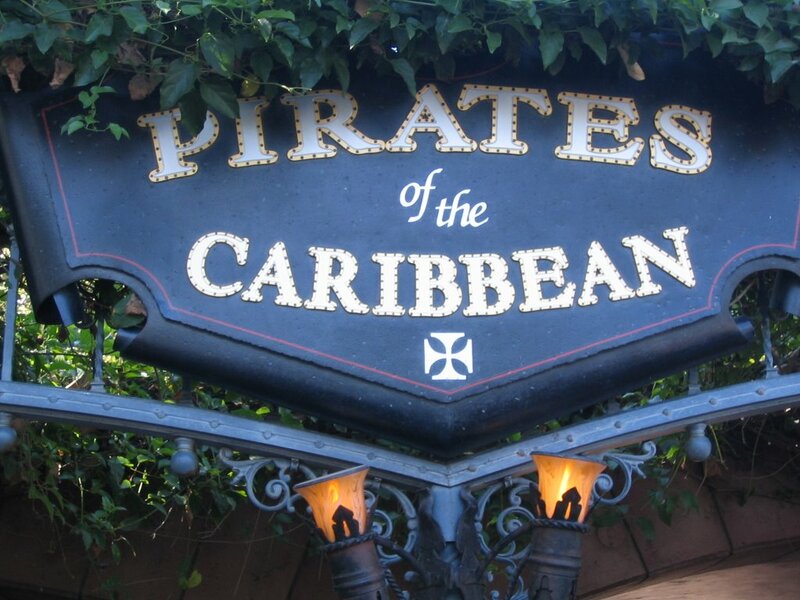 Pirates jumped off the Sailing Ship Columbia and "broke into" the ride building in order to open it! PIRATES OF THE CARIBBEAN: DEAD MAN'S CHEST, currently playing in theaters, is rumored to be coming to DVD this December. My family members enjoyed it but I'm warned it's even spookier... The third film in the series is due in theaters in 2007. Monday Update: A family friend got a look at Captain Jack's ship, the The Black Pearl, in San Pedro Harbor last week, where it is being readied for shooting the next film. My husband and daughter have tentative plans to take a boat ride to see it up close later this week. Well, actually, we spent most of the afternoon at Disney's California Adventure! The Southern California weather has cooled somewhat, and we had a wonderful afternoon, including (finally) seeing the stage production of Aladdin at the Hyperion Theater. We loved it! Great performances, music, and special effects -- even though Aladdin and Jasmine didn't ride overhead on the magic carpet as advertised. A delightful production. 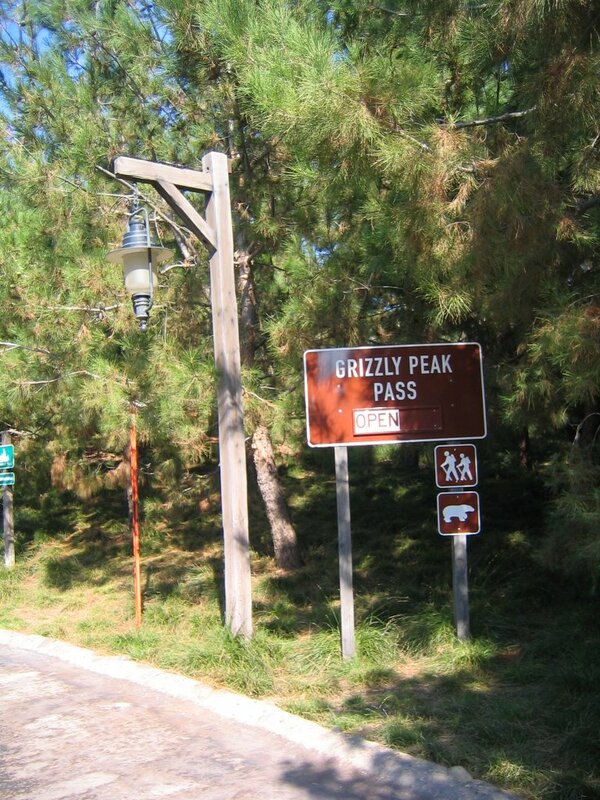 I especially enjoy the scenery in the Grizzly Peak area (left and below). 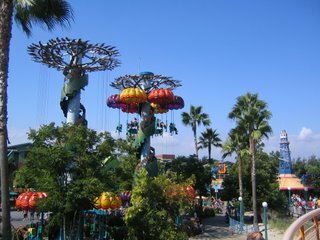 It was a beautiful day at Paradise Pier (above). 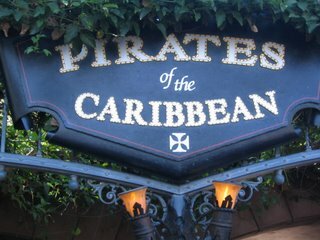 We ended the day by going over to Disneyland and taking another ride on the refurbished Pirates of the Caribbean. We wanted to see it a second time to more fully take in the new additions and special effects. A good day was had by all. Brit Hume was recently asked to throw out the first pitch at a Washington Nationals-New York Mets game. The Fox News Channel website has the video (above). Incidentally, Real Clear Politics is posting daily transcripts of the Special Report Roundtable discussions. A great resource if you miss your daily fix of Brit and the gang. Although most of the Fox News Channel website's news coverage is still Associated Press wire stories, the website has been gradually improving with content such as blogs and photo essays. A good example is Rick Leventhal's occasional blog posts from the front lines of Israel. The highly articulate Megyn Kendall, an attorney who serves as legal correspondent on Fox News Channel, has quickly become one of my favorites on Fox newscasts. I particularly enjoy her extended interviews with Brit Hume where they discuss issues in detail. Media Bistro's "Fishbowl DC" ran a lighthearted Q&A with Kendall on Thursday. Dershowitz: Bolton "Speaks With Moral Clarity"
The last week has had a couple of "pigs must be flying" moments. The latest surprise is Alan Dershowitz, a liberal Democrat, publishing an editorial in support of John Bolton in today's Washington Times: "Were he not to be confirmed as U.S. ambassador to the United Nations at this crucial juncture it would send a powerful message to the international community that Senate Democrats do not stand behind our policy in the Middle East. It would be seen as undercutting American policy toward Israel." Dershowitz also writes: "Mr. Bolton is absolutely justified in pushing for reform of the notoriously corrupt and inefficient bureaucratic structure in Turtle Bay." Those Democrats who are attempting to torpedo Bolton as Ambassador to the United Nations are willfully placing politics ahead of national security and undermining the War on Terror. As Power Line writes, Bolton is "the right man for the job." Now more than ever. Duncan Currie of The Weekly Standard on this week's victory against eminent domain in Norwood, Ohio. Today, however, curiosity got the better of me when I noticed some different-looking potato chips in the market: Lay's Sensations Kettle Cooked Potato Chips with Lime and Cracked Black Pepper. I love pepper and have recently acquired a taste for lime, so I thought I'd splurge and try them out since they were on sale. Yum! Spicy and unusual, not your ordinary potato chip. Check 'em out. The Ohio Supreme Court has ruled in favor of homeowners in Norwood, Ohio, declaring portions of the state's eminent domain law unconstitutional. In a unanimous ruling, the court ruled that "economic benefits" to a community do not constitute a valid use of eminent domain. The court also ruled that "a provision of Ohio's eminent domain law, which prohibits a judge from halting the taking of a government-acquired property before an appeal, is unconstitutional." More on this story at NewsMax. There is nothing I love to eat more than a good taco...this article makes me hungry just reading it. If the accompanying recipes interest you, be sure to print them before they disappear into the N.Y. Times' paid archives! I started making tacos with skirt steak last year. I use a recipe from the 2005 Summer Grilling issue of Everyday Food and rub the meat with a spice mixture including chili powder and cumin. Also, don't miss the companion article on California tacos. One of these days I'm going to make it to La Super Rica Taqueria in Santa Barbara. 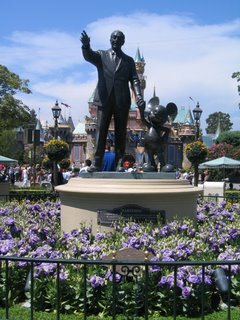 The L.A. Times notes that new Disneyland President Ed Grier may find it a challenge replacing Matt Ouimet: "Ouimet was a popular executive who spent hours walking through the park and talking to visitors and employees. He took the reins in late 2003 after a series of cost cuts had hurt park morale." The Times then quotes Disneyland expert David Koenig: "Everything turned around when he came on board. 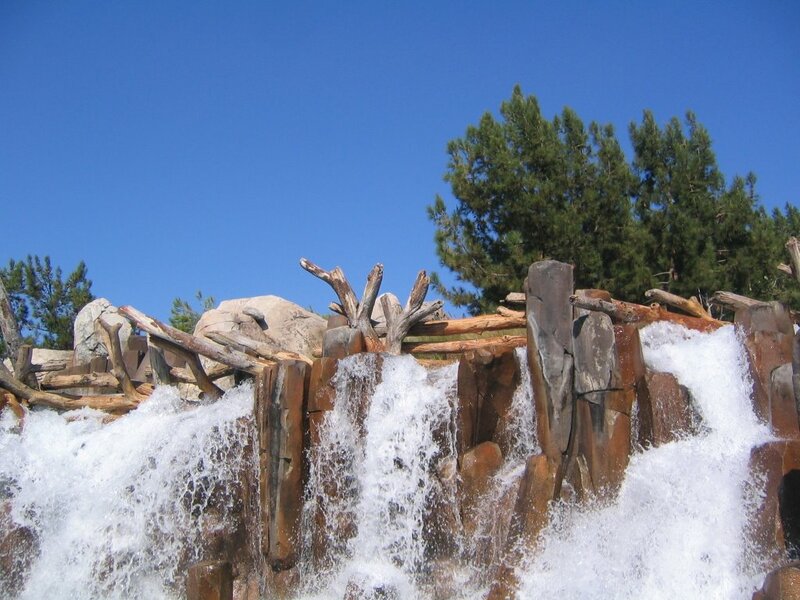 Disneyland's biggest problem is that it was falling apart...in less than two years, he got the place looking beautiful." We'll welcome Ed with an open mind and hope he continues Matt's legacy of investing in Disneyland and keeping it polished as the crown jewel of the Disney parks. New Disney animation and Imagineering head John Lasseter is said to have particular interest in Disneyland, so hopefully the park remains in good hands. On our college visits this spring we were quite impressed with the food, which is generally healthier, tastier, and provides more choices than my husband or I had when we were in college. Although many students might opt for the greasier food, there are plenty of good choices available every day. At my daughter's college, USC, students can also have a change of pace by using "dining dollars" on their meal cards to eat at campus restaurants like La Salsa or to buy microwave meals, such as Lean Cuisine, to prepare in their rooms. Every dorm room comes with a mini fridge/microwave combination. The L.A. Times goofed in this article, by the way -- the dining hall referenced at USC is Parkside, not Parkview. 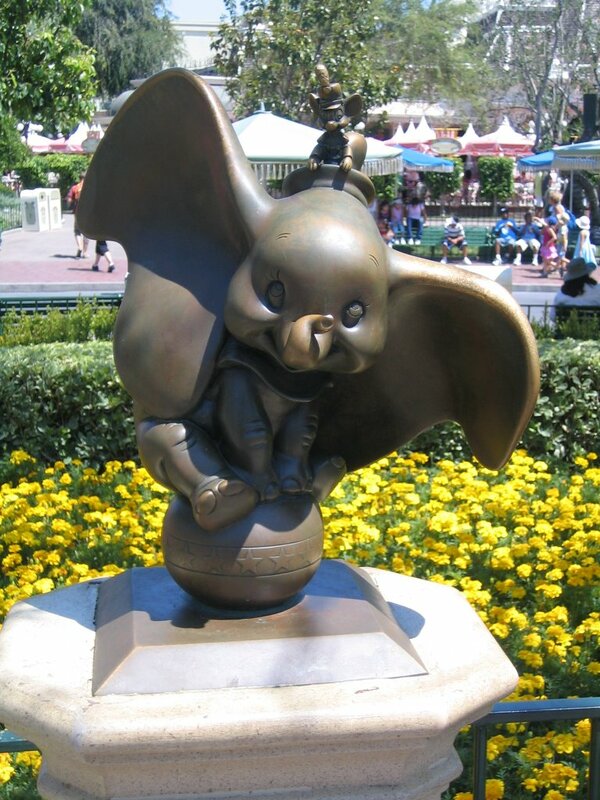 We were very sorry to learn of the resignation of Matt Ouimet as President of Disneyland. "Cast Member Matt" is leaving to head up Starwood Hotels. Ed Grier, who has been working at Tokyo Disneyland, will be taking over the helm at Disneyland. Under Matt Ouimet, Disneyland saw something of a renaissance from the previous Paul Pressler-Cynthia Harris administration. Pressler and Harris had run the park into the ground, attempting to squeeze every last penny of profit while refusing to acknowledge the long-term benefits of investment in new attractions and park maintenance. 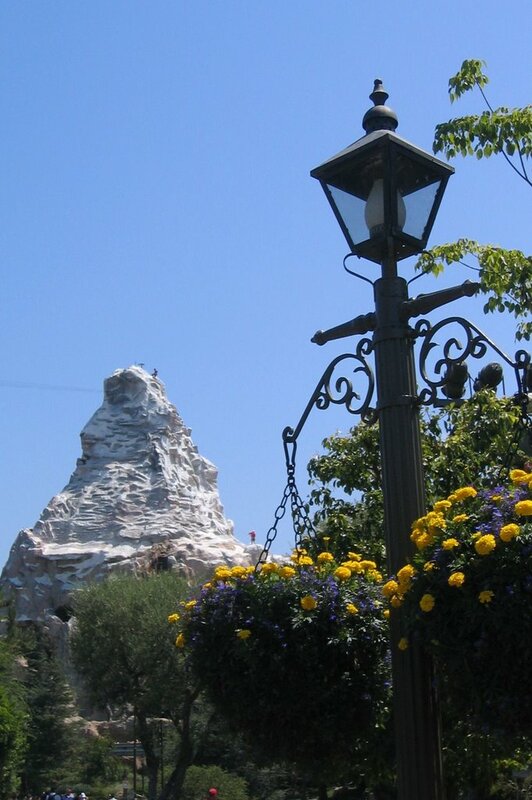 One of the first things Matt did was reinvest in the Disneyland's maintenance -- painting trash cans was an early project -- and it now looks better than it has in many years. It's a shame to see this major change in the park's management just when things were looking so positive. Disneyland fans are abuzz about the news at the MiceAge forum. It's bad enough that we can't afford to run our air conditioner due to rate increases and a new pricing strategy that penalizes heavier residential users, such as larger families who are home during the day. During today's scorcher (approximately 104 degrees) we couldn't even run a fan for three hours this afternoon, because Edison couldn't keep the power on. Nor could we buy groceries, because the store didn't have its power either. Power outages were a problem all over Southern California. I just love Edison charging highway robbery rates for services it can't even commit to fulfilling. (Yes, I'm cranky today, grin!) The state reached a Stage 2 power emergency, one level away from mandatory rolling blackouts. Someday California has to get serious about dealing with the environmentalist extremists and others who have prevented new power plants from being built to serve our state. This was an entirely predictable situation. I'm disappointed that Governor Schwarzenegger hasn't made increased electricity production a bigger priority. The governor says the demand on our plants today reached levels the state wasn't predicted to reach for another half a decade. (It's not politically correct to mention in some quarters, but I'd be curious to know the impact of illegal immigration on this aspect of our state infrastructure.) So...we're doubtless facing years of more power outages and blackouts. Nobel Peace Prize winner Betty Williams has said, "I would love to kill George Bush...I don't know how I ever got a Nobel Peace Prize." We just received a letter from the Census Bureau today notifying us that we're going to be expected to fill out the intrusive American Community Survey, which will be arriving soon. We will be expected to fill out detailed information about our educations, jobs, household expenses, and more -- even whether anyone in the household has medical or mental health problems. (Isn't medical information confidential under other laws?) According to my reading, if citizens refuse to share this information they'll eventually find a census bureau employee on the doorstep, and could face a $5000 fine. The survey is said to be 24 pages and take 38 minutes to complete. Will the Census Bureau be offering to pay me my normal hourly rate to compensate for the time I could be spending on my self-employment or family? (Obviously not...) It concerns me that the government feels entitled to take my time for something that (to me, at least) is unconstitutional. Whatever happened to taking a "head count" of the American people once every decade? How is it that the government is entitled to all the details of my personal life without a subpoena? I find it deeply troubling that our government has construed the simple word "enumeration" in the Constitution as giving it the authority to demand at will that we share any details the government desires to know about our personal lives. I can't imagine the Founding Fathers would approve. Don't miss this Thomas Sowell column on those who don't seem to understand that war is often a necessary prologue to genuine peace. Senator Kerry on the current situation in the Middle East: "If I was president, this wouldn't have happened." I'm just going to roll my eyes and stop there without further comment, other than to say I pray this man with an overly inflated sense of his own power never becomes President. Last month the Washington Post published this interesting description of some of the "backstage" tours available at Disney World parks. Many of us here in California received a nasty surprise when our electric bills arrived last week, thanks to rate increases that disproportionately penalize the heaviest residential users. We had already been carefully watching our electricity consumption, trying to offset the higher cost of gasoline in our budget, so it was quite a shock to receive a bill that was over $100 higher than our all-time highest bill. Because of the way the increase was structured, once you hit a certain usage rate, you get zapped. If you have a family of six, as we do, you're almost certain to be affected by the higher rate. An even bigger shock came in today's news: the rates are going up even more in August, and the increase is retroactive to last January 1st. The retroactive part particularly troubles me -- how can they rebill us for something for which we already paid? It's hard to imagine that's legal. Edison, in its "kindness," is going to spread the retroactive portion of the bill out over the next year. It was approximately 104 degrees in our city today, but we were afraid to turn on our air conditioner, having no idea what further costs to expect with the additional (and retroactive) increase next month. We finally caved in and turned it on at 4:00 p.m. We tried to compensate by only turning on a couple of lights tonight. We pretended we were camping, but this could get old really fast. It's absurd that a middle-class family, already carefully managing air conditioning use and being careful to switch off lights, should face several hundred dollars for a single month's electric bill. MOON OVER MIAMI is a very enjoyable musical in glorious Fox color, starring Betty Grable, Don Ameche, and Robert Cummings. Grable and her sister (Carole Landis) are two waitresses who have a plot to marry Betty to a Miami millionaire and thus improve the family finances. Their aunt (Charlotte Greenwood) is also along for the ride. The movie has hummable songs and some terrific dancing, particularly a number featuring Betty and famed dancer-choreographer Hermes Pan. My daughter at first thought Fred Astaire had wandered into the movie; Pan greatly resembles Astaire, his frequent collaborator. Some of the film was shot on location in Florida, with doubles apparently standing in for the stars; there is some pretty awful back projection behind the lead actors at times, but it adds to the movie's charm in a goofy sort of way. :) It's hard to be concerned about the special effects when you're also taking in the stunning gowns by Travis Banton and enjoying tunes like "Oh Me, Oh Mi-ami!" and "You Started Something." The leads are all charming, and the solid supporting cast includes Jack Haley and Cobina Wright, Jr. The film's running time is 92 minutes. MOON OVER MIAMI is available on DVD, as a single title or part of the Betty Grable Collection. It's also available on video. Things haven't been going so well for Robert Yates Racing this year. The wins haven't been coming, Dale Jarrett and UPS are leaving next year for Michael Waltrip's new team, and now the driver I root for, Elliott Sadler, is checking out. Sadler is expected to go to Evernham Motorsports. Now I have a big decision to make. Do I follow the driver...or the M&M's?! My oldest son's all-time favorite driver, Ward Burton, who is a tremendous guy currently in "involuntary retirement," is rumored to be a possible new driver for Yates. Possible problem: M&Ms wants a younger driver in its car. Speaking of coming out of retirement, Fox analyst Darrell Waltrip will be "borrowing" his brother Michael's car and competing in Saturday's Busch Series race, at age 59. The first order of business was to visit the newly remodeled Pirates of the Caribbean. We enjoyed it and found the movie-related additions fun; they didn't take anything away from the old ride (other than a little of the "Yo-Ho" music which seems to have been replaced by the movie's theme), simply added in a little new fun. Going through the "mist screen" after viewing Davy Jones was a particularly nice effect. 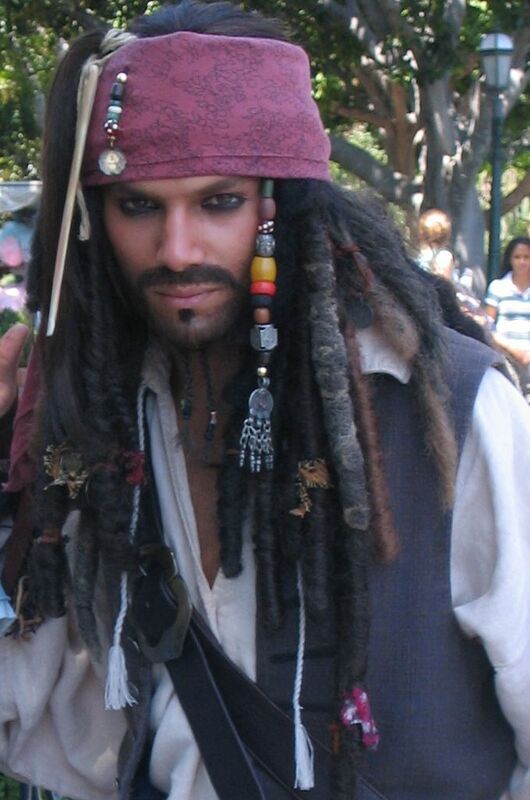 Next we paid a visit to Captain Jack Sparrow himself! All of our crew enjoyed meeting him. 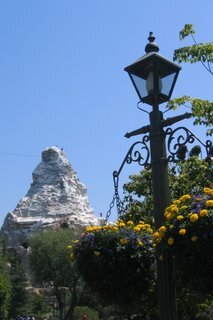 You may not be able to make them out, but there were two mountain climbers on the Matterhorn this morning. Click on the photo to enlarge it for a better view. A lovely sculpture of Dumbo at "The Hub" in front of Sleeping Beauty Castle. Is it possible Oliver Stone has made a movie that doesn't mangle the truth? A movie that inspires all Americans regardless of politics? Cal Thomas says the answer is yes, and Stone's WORLD TRADE CENTER is that movie. My neighbor worked on the sets for this film. I was kind of disappointed when I heard he was working on it as I believed Stone would produce the same kind of falsified, liberal baloney as he has in the past, and I feared he'd turn the subject of 9/11 into another expression of the BDS (Bush Derangement Syndrome) so prevalent on the left. Perhaps I was wrong. I hope so. The story of the rescue depicted in the film was movingly told in REPORT FROM GROUND ZERO by Dennis Smith, if I'm remembering the correct title. I'll await further reports on this film with interest. Update: Kathryn Jean Lopez at National Review Online joins in the praise for WORLD TRADE CENTER. Late Update: Cliff May at NRO's The Corner: "Words I Never Thought I'd Say: God Bless Oliver Stone." Michelle Malkin has posted a "Thank you!" to our troops assisting in the evacuation of Lebanon. Be sure to check out the wonderful photos posted at Michelle's site (subject link) and here. The fine men and women of our military should make all Americans proud. Here's an interesting article about the growing disparity between boys' and girls' performance in school, particularly when it comes to literacy. Researcher Judith Kleinfeld of the University of Alaska at Fairbanks has discovered something striking: although it's an issue in schools, there is no boy-girl "literacy gap" among homeschooled children. "In school, teachers emphasize reading literature and talking about character and feelings. This way of teaching reading does not turn boys on. Boys prefer reading nonfiction, such as history and adventure books. When they are taught at home, parents are more likely to let them follow their interests." She sure describes my oldest son. He has preferred nonfiction from the time he was a toddler (preferred topic at that age: construction). He enjoys reading about WWII, baseball, and NASCAR; when he does read fiction he prefers adventures such as SAVAGE SAM or THE HUNT FOR RED OCTOBER. When discussing books, he much prefers to talk about what people do rather than what they feel; he loves to discuss action, interesting facts (today: "Did you know Darrell Waltrip has an 18-inch plate in his leg, Mom? "), or funny anecdotes, though we do delve into character and motivation in his literature curriculum. My younger son finds fiction a little more interesting, but is happiest when reading about United States Presidents, especially Teddy Roosevelt or George Washington. :) He has quite a memory for dates. Kleinfeld will be publishing her research; I'll be awaiting it with interest. You've got to love the people who are using the evacuation of Lebanon as another excuse to criticize the President, particularly those who attempt to compare the evacuation of a war zone with the response to Hurricane Katrina. (Never mind that state and local authorities were responsible for leading the response to Katrina; that's another story...) It's a great example of the current obssession of many on the left with criticizing the President at any opportunity, no matter how silly the excuse. So much for pulling together as Americans when some of our citizens are, albeit by their own choice, in harm's way. As Rush Limbaugh has pointed out, the State Department has issued numerous travel advisories and warnings about Lebanon, and the Americans who chose to go there knew they weren't "going to Bermuda." Yet those who chose to travel to Lebanon anyway are expecting the U.S. government to instantaneously remove them from danger. Too many of our citizens seem to be losing traditional American ideals, such as individualism and personal responsibility, while becoming increasingly dependent on the government. The Washington Times (subject link) has written an excellent editorial on this topic, "Vacationing in Beirut." The San Juan Capistrano School District superintendent, who offered a not-very-believable denial that he didn't know anything about the so-called recall "enemies lists" with notations about parents and teachers, resigned yesterday. The President has vetoed federal tax dollars supporting embryonic stem cell research. Orange County Supervisors are planning to investigate why the registrar of voters disclosed names on recall petitions to San Juan Capistrano School District employees. The disclosures have led to allegations that the SJC District kept an "enemies list" of parents and teachers who supported the recall of the District's board. The SJC superintendent, James Fleming, who weakly protested last week that he didn't know about the lists ("It doesn't sound familiar, like anything I know about at all") now says that he didn't realize reporters meant spreadsheets he had "listing parents, teachers and others who received e-mails from pro-recall activists." Fleming insists that his lists were simply an innocent part of an effort to investigate possible hacking into the district computer system. But that doesn't explain why three spreadsheets disclosed by the Orange County Register last week also contained notes about the people on the list, including such adjectives as "outspoken" and "NIMBY." Today's L.A. Times (subject link) doesn't address this angle, but the question is raised in the Register. The Times reports that a former district employee says he was told by an employee at the registrar's office that letting district employees view the petitions was "improper" but that the registrar was making an exception. Parents told the supervisors that the registrar put their children in danger of retaliation. Everyone involved, at both the district and the registrar's office, seems to have forgotten who they serve...parents and taxpayers. Our Orange County tax dollars at work. The Los Angeles Times spent an entire news article today on the rantings of a Lebanese American couple who blame the war between Israel and Hezbollah...on the United States. "The worst moment, the couple said, occurred last week when they clustered around a TV set watching the news with family and friends in Tripoli, Lebanon. ...all were convinced that the U.S. would broker an immediate cease-fire to stop their homeland's destruction... Instead, the United States blocked U.N. plans for a Middle East cease-fire resolution. 'All of my family looked at me and said, 'Look what your country has done. How could this be possible?''" The couple were "embarrassed" and "betrayed," with their "pride as Americans" now "shattered." Although they experienced bombings and an escape to Syria, "those weren't the most traumatic moments"...no, the United States provided the real trauma. The article also reads like an anti-Republican campaign piece, with the couple interviewed saying the Republicans "let the use of excessive force happen" and thus it's "time for a change" during this fall's elections. This one-sided hit piece against the United States -- and, by extension, Israel -- really qualifies as "news"? Israel is apparently not allowed to defend itself against terrorism, and if they do it's the "fault" of the United States. If the Times truly felt one couple's point of view belonged in the news rather than the opinion pages, then they should have at least run the article alongside another perspective...perhaps an interview with the wife of one of the Israeli soldiers kidnapped by Hezbollah. USA Today has an interesting article on a crop of new books on varied topics with one theme in common: baseball. Speaking of baseball, don't miss this piece comparing the unfortunate behavior of French soccer star Zinedine Zidane to the courage of baseball great Jackie Robinson. I recently discovered this terrific cooking site, which has step-by-step photos along with clear directions for each recipe. The header on the blog says "Have an analytical mind? Like to cook? This is the site to read!" I'm not much of a creative "wing it" cook; the clearer the directions, the better. (That's one reason I like the recipes by Cooks Illustrated so much; they're thorough and explain the whys and wherefores of each step.) Needless to say, this site appealed to me greatly. The detailed recipe for chocolate cake is an excellent example of the blog's style. I'll be visiting again often in future. As I mentioned last week, George Allen is currently the potential Presidential candidate who most interests me. I was amused to read that Allen and I root for the same NASCAR driver, Elliott Sadler. Unfortunately, Elliott's not having a good year and is currently No. 20 in the standings. The New York Times will be reducing both its page size and its staff in the face of poor earnings. The paper will slash a full half a foot off a double-page spread. I'm amused by Bill Keller's statement "I'm convinced that, with good editors and a little time, I could take 5 percent out of any day's paper and actually make it better." Well, Bill, then why haven't you already done that? :) That statement seems rather like a captain smiling and asserting everything's fine as the ship takes on water and starts to sink. Meanwhile, yesterday L.A. Observed reported that the Los Angeles Times is dramatically reducing its hockey coverage and will no longer have beat writers follow the Kings and Ducks on the road. I'm not a hockey fan, but the Sports section is the main reason left to purchase the L.A. Times, so cutting the increasingly slender Sports section even further strikes me as a questionable business decision. An Appalling Column: "Israel a Mistake"
Richard Cohen of the Washington Post has written a truly reprehensible column in which he alleges that the nation of Israel was "a mistake"...his point is basically "What else did you expect to happen amidst a bunch of Arab countries?" Cohen: "There is no point in condemning Hezbollah. Zealots are not amenable to reason. And there's not much point, either, in condemning Hamas. It is a fetid, anti-Semitic outfit whose organizing principle is hatred of Israel. There is, though, a point in cautioning Israel to exercise restraint." So because Israel is surrounded by intolerance, it never should have existed in the first place, and rather than condemning the terrorists, Israel (and, apparently, the rest of the world) should just give up and accept them? Some days I'm simply speechless. 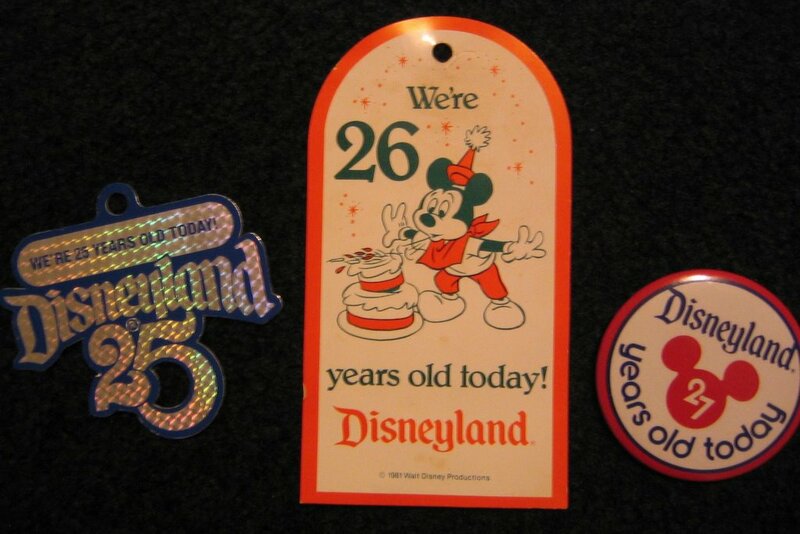 Today is Disneyland's official 51st birthday. 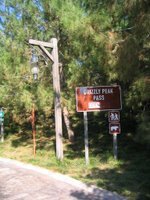 The Long Beach Press-Telegram marked the day with an interview with the park's director of merchandise. Update: Below is a peek at some of the past cast member anniversary goodies I mentioned. The cards on the left and center were worn attached to carnations, and on the right is my favorite, a birthday button. Frank Sinatra's longtime pianist, Bill Miller, has died. Miller, who accompanied Sinatra off and on for over four decades, was still a working musician who was touring with Frank Sinatra Jr. until two weeks ago, when he broke his hip. Miller is particularly known to some for his piano solo in Sinatra's "One for My Baby (and One More for the Road)." He was a significant participant in the creation of some of my favorite music. An additional obituary can be found at The Washington Post. The U.S. Post Office has released some colorful new "Baseball Sluggers" stamps featuring Roy Campanella, Hank Greenberg, Mickey Mantle, and Mel Ott. 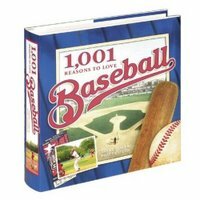 If you're a baseball fan you may want to check them out. Incidentally, I was glad to see that the Post Office has extended the life of the Ronald Reagan commemorative postage stamps. The stamps, which were originally issued at the 37 cent rate, have been reissued as 39 cent stamps. ...or perhaps I should say a boxcar. Sunday's L.A. Times had a fascinating article on the popularity of do-it-yourself house construction kits in California in the early 1900s. The homes were ordered from catalogues and shipped to the recipient by boxcar...in 12,000 pieces! President Richard Nixon was born in a kit home his father built in nearby Yorba Linda. If I remember correctly, it was constructed from a Sears kit. The article mentions that Walt Disney and his brother Roy built Pacific Ready-Cut homes near their studio in 1928. 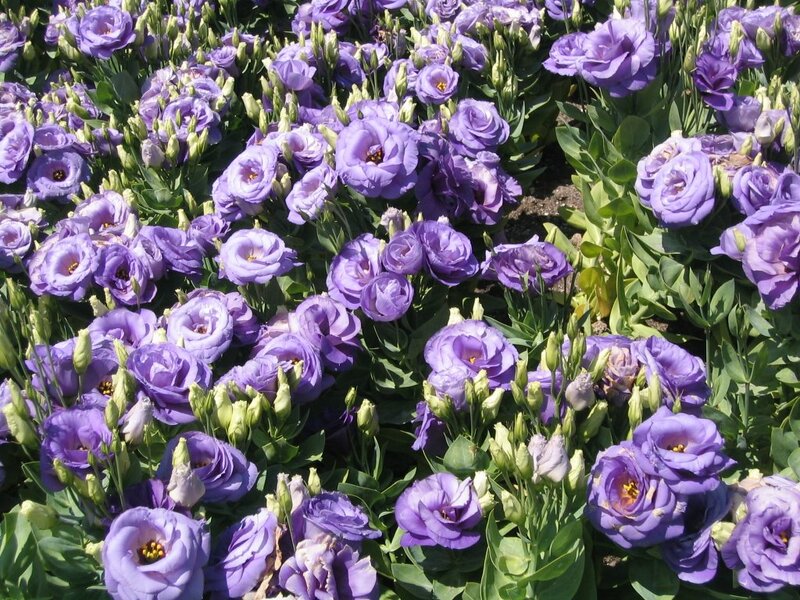 The Pacific Ready-Cut Catalogue reproduction referenced in the article can be found here. The author, Rosemary Thornton, has also written a book on Sears houses. An interesting bit of history from our nation's past. One year ago today Laura's Miscellaneous Musings began with the above post. It's hard to believe it's been a year already! It's a particular pleasure being able to share "good things" I've come across -- whether articles, movies, or recipes! -- with others. I also appreciate the opportunity to share my thoughts here regarding a wide variety of issues. I especially want to thank my family and friends (you know who you are!) who have supported and encouraged me in this blogging adventure, and all the bloggers who have linked and commented here over the past year. One of the nice things about blogging has been "meeting" some wonderful fellow bloggers! I recently came across an interesting profile of Judy Rodgers, chef at California's Zuni Cafe, in the L.A. Times. The article focused on how Rodgers uses salt to bring out the best in different kinds of meat. Along with the chicken I made mashed potatoes and milk gravy with some of the fried chicken drippings. I added a little more salt and pepper than the gravy recipe called for. I wouldn't make fried chicken on a regular basis for health reasons, but as an occasional treat it's really wonderful. Highly recommended. This is another musical treasure from 20th Century-Fox. The magic begins as "Moonlight Serenade" plays under the opening credits. The plot is a bit silly but interesting, concerning a trumpeter (George Montgomery) with the "Gene Morrison Orchestra" (the Glenn Miller Orchestra) who impulsively marries a dreamy-eyed young girl (Ann Rutherford) he spots at a performance; she has to adjust to life on the road and deal with the catty gossip of some of the other "orchestra wives." "I've Got a Gal in Kalamazoo" was nominated for the Academy Award for Best Song, but lost to a forgettable little ditty called..."White Christmas." One of the other nominees that year was Jerome Kern's "Dearly Beloved." It's kind of sad to compare that list to this year's Oscar nominees, particularly the ultimate 2006 winner, "It's Hard Out Here for a Pimp." What a comedown for movies and the Academy, going from the genius of Warren, Berlin, and Kern to a song that can't be listened to by children. ORCHESTRA WIVES has a terrific supporting cast full of the usual 20th Century-Fox players, including Cesar Romero, Lynn Bari (as in SUN VALLEY SERENADE, she's a witchy "girl singer"), Carole Landis, and Harry Morgan. The movie is in black and white and has a running time of 98 minutes. ORCHESTRA WIVES is available on DVD as No. 35 in the Fox Studio Classics series. The DVD includes a stills gallery and a commentary by leading lady Ann Rutherford and dancer Fayard Nicholas. The movie is also available on VHS. Larry Elder has written an outstanding column comparing when a 5-3 or 5-4 Supreme Court decision is reported in the "main scream" media -- Elder's new variation on the meaning of "MSM" -- as a "sweeping rebuke" or a "broad rejection" and when the same vote is portrayed as a "deeply divided" court or a "narrow majority." No surprise that close decisions are "rebukes" and "rejections" if they go against the Bush administration, but are characterized as barely passed squeakers if the results are not in line with liberal ideals. I had noticed the L.A. Times headline Elder quotes ("High Court Rejects Bush's Claim That He Alone Sets Detainee Rules") and thought about what unnecessarily pointed wording was used by the Times. The decision wasn't an opportunity for straight reporting on a decision which overturned over 6 decades of legal precedents; it was instead used by the Times as an opportunity to zing President Bush. Elder also revisits one of the "great lies" of our time, that the Supreme Court decision in Bush v. Gore in 2000 was a 5-4 decision. It was, in actuality, a 7-2 decision on the main equal protection issue; the 5-4 vote often referred to in the press was actually about the "remedy" which should result from the 7-2 vote. Don't miss Elder's column, it's a gem. USA Today recently ran an interesting article on Brian Stelter, the blogger behind TV Newser. In recent months this site has become a regular visit for me. I had no idea it was written by a college student. The Senate, incredibly yet somehow not surprisingly, has voted against funding the 370-mile border bill it authorized in May. There was a reasonable question raised about the funding, insofar as the money to fund the fence was going to come from cuts to border patrol agents and detention facilities, which makes no sense whatsoever. The Senators needs to get to work cutting out some of the pork so dear to their hearts in order to fully fund the fence and the border patrol, but of course that idea would be an anathema to them. On top of this, yesterday Senate Minority Leader Harry Reid killed an amendment which would have helped end "catch and release" of illegal immigrants. Reid used a procedural manuever to prevent a vote. The Senate, as feared, seems to be doing a smoke and mirrors routine when it comes to border control. Dan Rather has, at this point, become a rather sad and pathetic figure who seems bent on destroying any journalistic reputation he might have had left. Case in point, on Wednesday he said he "absolutely" believes in the discredited National Guard story. Rather is apparently so consumed by BDS (Bush Derangement Syndrome) that even after losing his newscast and his CBS job, he insists on clinging to the false story that brought him down; not only that, he is playing the martyr, hinting that "powerful people" wanted to "damage him up." He's also considering a lawsuit against CBS. Mr. Rather, you have no one to blame but yourself. So what do Plame and husband Joe Wilson do? Just what you'd expect an "undercover" CIA operative who's listed in Who's Who and poses for Vanity Fair to do: they filed a nuisance suit against the Vice President and others for conspiring to destroy Plame's career. John Podhoretz predicts that before this is all over, Plame and Wilson may become laughingstocks. Not if the "mainstream" media can help it. Isn't it interesting, in this case we have an alleged leak amounting to nothing, which the media has treated as a crime of the greatest magnitude. Yet when there have been real leaks to the media, about serious matters such as classified intelligence programs, then the leakers are noble public servants helping the media to protect the public from the government. Captain's Quarters has entertaining analysis here and here. USA TODAY has a fun article on those great NASCAR commercials which help make the races so much fun. The article includes video links to some of NASCAR's most popular commercials, including one of Darrell Waltrip's wild rides for Toyota and Jeremy Mayfield using a Nextel phone to direct the crushing of Tony Stewart's car. Our favorite NASCAR commercials are the UPS "Race the Truck" ads with Dale Jarrett. :) We were delighted to read the announcement that UPS will be continuing to sponsor Dale next year when he leaves Robert Yates Racing for Michael Waltrip's new team. ...I would never vote for John McCain for President. Even if he were running against Hillary Clinton. The interview underscores once more why I don't believe John McCain will ever be President, at least if he runs as a Republican. His attitudes are such that it seems impossible to me that he could win the primaries. Among other things, he complains about the strength of the "Religious Right": "I urge my friends who complain about the influence of the religious Right, get out there and get busy. That's what they do!... The fact is, some of us have sat idly by while those very active people have basically set the agenda for our party." And the problem with that is...? He goes on: "I understand the frustrations a lot of Republicans feel. We're not representing their hopes and dreams and aspirations. We worry about Ms. Schiavo before we worry about balancing the budget. We're going to take up this Family Marriage Amendment again. Why?" Well, Senator, you're certainly not representing my hope for control over our borders... The rest of this comment simply makes me roll my eyes in exasperation. He crabs about radio talk show hosts: "I would never say this publicly, but some of these talk-show hosts—and I'm not saying they should be taken off the air; they have the right to do what they want to do—I don't think they're good for America...."
Considering the restrictions on free speech under the McCain-Feingold Act, I frankly am not completely comfortable that Senator McCain really doesn't think they should be taken off the air. Further, Senator McCain obviously has no clue how much good radio talk show hosts have done for the free exchange of ideas in this country, or how much they have helped his party...or perhaps it's more that he doesn't like what radio talk show hosts have done, because he isn't a conservative, he's a RINO. Hugh Hewitt generously says that he would vote for Senator McCain if he's the Republican Presidential nominee, but after years following McCain's career, I cannot agree with Hugh. McCain may hold some conservative positions, but I feel that I would be choosing, in essence, between two Democrats. I greatly respect the Senator's military service to our country, but in all honesty I also have serious concerns about whether he is temperamentally suited to the office of the Presidency. Last week Ronald Kessler wrote a piece for NewsMax addressing this topic. He isn't the first to raise the issue. I've heard enough rumblings about McCain's behind-the-scenes behavior over the years to think that it merits a closer look by voters before electing him to the highest office in the land. I'm not a Mitt Romney fan -- I don't understand why more conservatives aren't troubled by his mandatory health insurance program in Massachusetts -- and at this early date lean towards Governor (now Senator) George Allen as the nominee I could most enthusiastically support. But whoever the nominee turns out to be, no McCain...not now, not ever. I just discovered this little gem of a film for the first time a couple of years ago, and our family enjoyed it again this evening. The plot, which centers around a big band's engagement at the title resort, is paper thin, but who cares when you've got Glenn Miller and His Orchestra, Dorothy Dandridge singing, the Nicholas Brothers dancing, Sonja Henie ice skating, and Milton Berle cracking jokes? John Payne is the film's leading man. The movie has a show-stopping "Chattanooga Choo-Choo" number which begins with Miller's band playing the instrumental version...Tex Beneke and the Modernaires then pick up the vocals...then the number comes to a climax with Dorothy Dandridge and the Nicholas Brothers singing and dancing. This "Wow!" number will doubtless be revisited by our family many times when the movie makes it to DVD and we have the convenience of chapter stops. :) "Chattanooga Choo-Choo" received an Oscar nomination as Best Song. The score also includes "In the Mood" and the delightful "It Happened in Sun Valley." In addition to the nomination for Best Song, SUN VALLEY SERENADE received nominations for Best Scoring of a Musical and Best Black and White Cinematography. Like many Fox films of its era, the movie is on the short side, clocking in at 86 minutes. 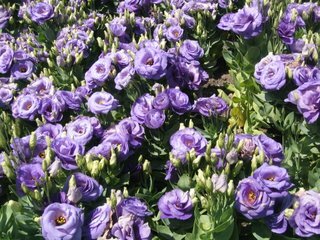 SUN VALLEY SERENADE is available on video. December 2012 Update: I've now posted a more detailed review elaborating on the points in this post, illustrated with several stills and posters. 2018 Update: This film can be streamed on Amazon. Vice President and Mrs. Cheney became grandparents again on Tuesday, as their daughter Elizabeth gave birth to her fifth child, a son named Richard. Congratulations to the Cheney family! "...at least 60 signs of loose bolts and other potential failures were found in the same Big Dig tunnel where a motorist was crushed by falling concrete. Initial inspections by state officials revealed that some bolts had started to come out of the concrete in the eastbound connector tunnel, part of the main route to Boston's Logan Airport. Gaps also had developed between the ceiling and metal plates that help hold the massive panels in place...an undetermined number of similar problems areas were found in two adjacent tunnels, raising the possibility of a broader design or construction flaw." The Big Dig surely must be one of the biggest taxpayer disasters in history. Thursday Update: The Boston Globe reports that problems with the bolt fixtures have been known since testing in 1999. The scope of the problem continued to grow today with the revelation that the 60 flaws initially found have escalated to 240 possible defects identified thus far. The Massachusetts Attorney General is considering manslaughter charges. Laura Lee Donoho at The Wide Awake Cafe has written today about female conservative bloggers who support the War on Terror. I was honored to discover Laura Lee had listed this blog alongside other bloggers whose work I deeply respect. Thank you! I highly recommend checking out Laura Lee's list and visiting any blogs which might be new to you. Orange County's San Juan Capistrano School District has been embroiled in a recall controversy, as parents and teachers who are upset that the district is spending millions for a new administration building, rather than improving school facilities, have attempted to recall the district trustees. The Orange County Register broke a disturbing story on Monday. It transpires that San Juan Capistrano School District employees were illegally shown recall petitions by the county registrar. The employees -- who, it should be added, were on taxpayer work time -- made spreadsheets with names of parents and teachers who supported the recall. The information on over 150 families includes lists of schools attended by the families' children, sparking fears of retaliation by district employees. It has been alleged that the District Superintendent, James Fleming, had custody of the lists. He gave the Register a vague denial: "It doesn't sound familiar, like anything I know about at all." One of the troubling aspects of this story is it demonstrates that the school district employees appear to have been more interested in maintaining their power than in remembering who they are employed to serve: taxpayers and voters. More from the L.A. Times and the Register editorial page. "All Immigrants Are Real Americans"
It's bad enough that Karl Rove spoke at a convention of the racially separatist group La Raza, an organization which advocates "reconquering" the Western United States. What's worse is what Mr. Rove said today; in a jaw-dropping statement, he asserted that the immigration debate has "clouded the views of some people in America and led them to fail to understand that Hispanics, and all immigrants, are real Americans." In the first place, I'd love to see a transcript showing that anyone has ever said that Hispanics -- Hispanics who are here legally -- aren't "real Americans." For Mr. Rove to imply that those who don't agree with the administration's immigration plan have "clouded views" and a lack of understanding or appreciation for immigration -- and, reading between the lines, are racist -- is deeply insulting. How many Americans, after all, are descended from immigrants? And if he's not speaking about the administration's critics, who else would he be speaking about? This is, after all, the administration that referred to the Minute Men, who seek only to observe and report those breaking the law, as "vigilantes." If Mr. Rove thinks that "all immigrants" -- which implies legal or illegal --are "real Americans," we've got bigger immigration problems than I thought. I very much respect President Bush and have been loyal to the administration, even when I've felt compelled to speak out on certain areas of disagreement. But Mr. Rove's double insult -- speaking to La Raza and then dissing some mythical Americans who think Hispanics aren't "real Americans" -- really takes the cake. There can be honest disagreement among Americans, or conservatives, about the proper way to deal with illegal immigration, but gratuitous digs such as Mr. Rove offered today are not only unnecessary, they distract from this important debate. Mr. Rove owes his fellow conservatives -- people like me, who believe deeply in legal immigration and in upholding our nation's laws and protecting its sovereignty -- a deep and sincere apology. Further commentary from Joseph Farah at World Net Daily. 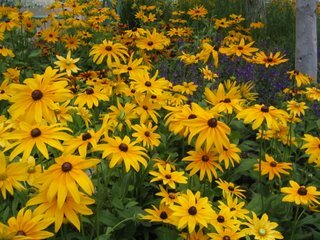 Sallie at A Gracious Home has posted the nominees and finalists for the 2006 Blogs of Beauty Awards. These awards were created to help honor "the women who bring the beauty of the Lord Jesus to the blogosphere." The awards have also been a way to help call attention to "smaller" bloggers and introduce Sallie's readers to new blogs to visit. I'm delighted to say this blog was a nominee in the "Best Meet for a Mocha" category as "The blogger you have never met and would most like to meet in person for a mocha." Needless to say, I'd love to meet my readers, too! I appreciate one or more of my readers taking the time to submit my name. Be sure to visit A Gracious Home and check out the four blogs which were the finalists in this category, and take the time to explore the many other nominees and finalists as well. I discovered some wonderful new blogs to visit as a result of the previous awards. As I approach my first anniversary of blogging in the next few days, I've been pondering blogging, in general, of late. Glenn Reynolds of Instapundit has posted a couple excellent links to blogging tips from Sister Toldjah and Simon World. They contain a lot of good advice, and emphasize some points that I think are particularly important: write because you love it, and be yourself. The Washington Times zeroes in on the "terrorist loophole" in the Senate's immigration bill, which would prevent state and local police from making immigration-related arrests and impede cooperation between those agencies and federal law enforcement. The Times notes that the "wall" is receiving closer attention after the hearings held last week by my Congressman, Ed Royce. My hat is off to the House Republicans and particularly my Congressman for not backing off on this issue despite pressure from the Senate, the White House, and the "mainstream" press. This member of the "conservative base" will be happy to support Mr. Royce again in November. Nearly half a decade has passed since September 11th, and the Senate is back to operating with a September 10th mentality. Further obituaries can be found at The New York Times and The Los Angeles Times. Why Was This Man "Cleared of Wrongdoing"? Lost amidst the squabble over whether the TSA or Houston Police was responsible for letting a (very) suspicious man on board a flight: What's with the offhand comment that "The FBI eventually cleared the man of wrongdoing"? Let's review: He was asked if he had a laptop and lied that he did not, when he did. He had curious footwear: "The entire soles of both shoes were gutted out." I know I always travel with the soles of my shoes completely gutted out. And "A search of the man's baggage revealed a clock with a 9-volt battery taped to it and a copy of the Quran." Maybe I'm missing something here, but if that's not a rather profound batch of circumstantial evidence, I don't know what is. And, at minimum, isn't lying to a TSA screener some kind of offense in this day and age? The FBI said, "It was looked at and deemed a non-event." Okaaaaay. I simply hope that this man was let go because the FBI has him under surveillance to see if he leads to other terrorists. Deborah Orin of The New York Post has written an enthused piece on Tony Snow, who, according to former Presidential Spokeman Mike McCurry, has tamed the White House Press Corps and "turned the thermometer down...getting people back to the real business of reporting what matters." Carole Lombard was one of the most delightful stars of Hollywood's Golden Era. She lit up the screen with her effervescent personality and was equally adept with both comedy and drama. Lombard appeared in some of Hollywood's greatest comedies, including MY MAN GODFREY and TO BE OR NOT TO BE, before her tragic death in a plane crash while on a war bonds tour in 1942. THE PRINCESS COMES ACROSS is an excellent showcase for Lombard's talent. She plays Swedish Princess Olga, who is traveling by ocean liner to America and a new career in Hollywood. Princess Olga, it turns out, is not exactly as she seems, as band leader King Mantell (Fred MacMurray) quickly discovers. Lombard and MacMurray made several films together and have excellent chemistry in this film, which mixes screwball comedy and a murder mystery, with a little concertina music thrown in on the side. The supporting cast includes reliable comedy actors Sig Ruman, Mischa Auer, and William Frawley. The movie, set entirely on a very attractive ocean liner, breezes by in a little over an hour and 15 minutes. THE PRINCESS COMES ACROSS is available as part of a recently released DVD set of six Lombard movies, as well as on VHS. Update: THE PRINCESS COMES ACROSS is now also available as a single-title DVD release in the Universal Vault Series. Bill Keller continues to prove that he really is as intellectually lacking -- or as dishonest -- as feared. Radio Blogger has posted the transcript of Keller's friendly interview with Charlie Rose, in which Keller asserts, among other things, that anger at his paper regarding the SWIFT program disclosure is due to administration embarrassment over the leaks. The mind boggles. No one could actually be angry about the paper compromising national security and endangering fellow Americans, in Keller's self-serving view. Keller also says that nothing about the SWIFT program has changed since the story broke...perhaps he hasn't heard about Belgium now "investigating" the SWIFT program, throwing future cooperation into question. Keller again: "Nobody in the administration, and no member of Congress that I'm aware of has claimed that any consequence has occurred as a result of this story, or any unpleasant consequence." Well, if the New York Times interrupted top-secret investigations, such as the one that led to yesterday's arrests, does he expect the administration to immediately publicize the consequences of the Times' publication? Meanwhile Congress may be too fearful of the media's power to subpoena Keller and the staffs at the N.Y. Times and L.A. Times to investigate the leaks. Not exactly reassuring. Read the entire Keller interview and consider what the consequences might be of liberal government bureaucrats leaking to this man and his paper in order to undermine our nation's security. The plot uncovered for New York transit, planned for this September 11th, should be a wake-up call to everyone. But until the Justice Department or Congress are prepared to act to prevent more disclosures, it seems that the United States now has a President Bill Keller. I don't remember voting for him, do you? Lawrence Kudlow: "Did you know that just over the past 11 quarters, dating back to the June 2003 Bush tax cuts, America has increased the size of its entire economy by 20 percent?" More: "Since the 2003 tax cuts, tax-revenue collections from the expanding economy have been surging at double-digit rates while the deficit is constantly being revised downward." As Kudlow points out, the media aren't exactly broadcasting this news. Read the rest of Kudlow's fascinating article for the encouraging facts about our economy under the Bush Administration. Update: Ed Morrissey provides further facts and analysis. Mary Katharine Ham, who has been doing an excellent job guest blogging with Hugh Hewitt in recent months, will be leading Town Hall's new group blog. Lots of interesting changes afoot at Town Hall. (They just need faster-loading pages!) Check it out. Did the NYT Interrupt NY Terrorism Investigation? Today's New York Times headlines that the plot was caught in an "early stage," which begs the question, if the Times' disclosure forced law enforcement to move in and make arrests more quickly than planned, did we lose the ability to track and arrest additional terrorists? What intelligence programs were used to catch the PATH terrorists? The NSA wiretapping program? SWIFT? If this terror plot against New York had been able to go forward unimpeded thanks to the NYT's disclosures, the deaths of countless fellow New Yorkers could have been laid directly at the feet of The New York Times, as well as its partner in crime, The Los Angeles Times. What other investigations may be going on which the New York Times arrogantly disrupted due to the disclosure of our classified intelligence programs, which were somehow both a big secret and "common knowledge"? Which Americans are in danger right now thanks to the New York Times and Los Angeles Times? Update: Hugh Hewitt points out on his radio show that The New York Daily News is also complicit in disrupting this investigation, publishing -- on the one-year anniversary of the London Tube bombings, no less -- details of an "ongoing operation" which had "been kept under wraps for months." ...is now a verb in Merriam-Webster's. As a proofreader, I always enjoy "word news" and following our ever-evolving language. England may get rid of St. George as its patron saint because St. George is "too warlike and may offend Muslims"? The fear of offending Muslims is getting seriously scary. British banks banning piggy banks for fear of upsetting Muslims was quite bad enough...but St. George?! It's time to "just say no" to political correctness. GREY'S ANATOMY received a deserved nomination as Best Drama...but what will it take for Lauren Graham to ever receive a Best Actress nomination for GILMORE GIRLS? The complete list of nominations is here. Meanwhile, taking a dip into GILMORE GIRLS gossip, TV Guide and People report that Alexis Bledel (Rory) and Milo Ventimiglia (Jess) have broken up after 3-1/2 years as an offscreen couple. When asked by TV Guide if he would return for further guest appearances on GILMORE, Ventimiglia said flatly, "Never gonna happen." That's too bad, I really enjoyed seeing how Jess had changed in his appearances on the show last year. Robert Novak's latest column is on the House immigration hearings, which began Wednesday in San Diego and continue Friday in Laredo, Texas. As Novak writes, "This week’s hearings make the point that the Senate bill is filled with details that have escaped wide attention." Under particular scrutiny on Wednesday was the "terrorist loophole" provision in the Senate's bill that would make it illegal for local law enforcement to make immigration-related arrests. Hopefully the hearings are doing as hoped and calling the public's attention to some of the provisions in the Senate bill which were not widely discussed in the media when the bill was passed. Senator John Kerry's spokeswoman says that this year Senator Kerry's "personal mission" is electing veterans to Congress, so he will only be endorsing primary candidates who are veterans. Thus, Kerry can conveniently avoid endorsing fellow Senator Joseph Lieberman, who is fighting a difficult primary battle. Of all the Democrat Senators in Congress, Joe Lieberman is probably more supportive of our troops than any other Democrat. You'd think someone like Kerry, who is so concerned about electing veterans, would also want to help re-elect someone who strongly supports the troops. But of course, Senator Lieberman supports our mission in Iraq along with the troops, which makes him the equivalent of poison ivy in Senator Kerry's eyes, as Kerry tilts ever leftward. I would be quite pleased if Senator Lieberman eventually decides to leave behind his unsupportive colleagues and join the Republican Party. I find it deeply disturbing that Karl Rove is among those who will be speaking at a La Raza conference this weekend, giving a speech on immigration. Senator Sam Brownback and former President Bill Clinton are among the other politicians scheduled to speak at the conference. Michelle Malkin has more links. La Raza is a racial separatist group which advocates "reconquista" -- reconquering the Western United States. La Raza does not believe in equal rights; their motto is "For The Race, everything. Outside The Race, nothing." Karl Rove wouldn't visit a conference of the KKK or any other racist group, so why is he spending time with La Raza, especially as it, in essence, advocates the overthrow of the United States? His appearance is, unfortunately, a bow to political correctness. Too many people have no idea what La Raza's members believe, and so politicians, even those who are part of the current administration, look the other way and ignore the threat the group represents to our borders and national sovereignty, in hopes of courting Hispanic votes. Legitimizing La Raza and ignoring the group's goals certainly doesn't reassure those of us who are also concerned about the administration's lack of seriousness when it comes to securing our borders. A few days ago Arlen Specter signaled that the Senate might be shifting toward a willingness to compromise with the House and agree to a "border enforcement first" policy. According to The New York Times, President Bush is now also signaling behind the scenes that he may be willing to compromise and agree to legislation in which certain border security goals must be met before his guest worker and "path to citizenship" programs are implemented. I find this possible change very encouraging, and it shows once again how important it is for conservatives to maintain their principles under pressure. Don't miss this story about the flag which Rick Monday saved from being burned at Dodger Stadium in 1976. It's been on a very special cross-country journey as it traveled to Dodger Stadium for Independence Day ceremonies. Photos of the Patriot Riders during the trip can be found here and here. 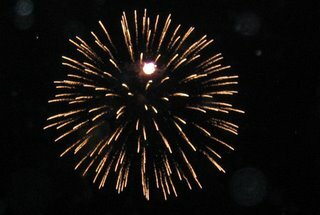 Discovery's liftoff today may be the biggest "fireworks show" our country has enjoyed in its 230 years. Our family visited Kennedy Space Center two summers ago, and it was a thrilling experience. I felt the same deep emotion looking out at the launch gantry as I did when I first viewed the Lincoln Memorial from the Capitol steps. 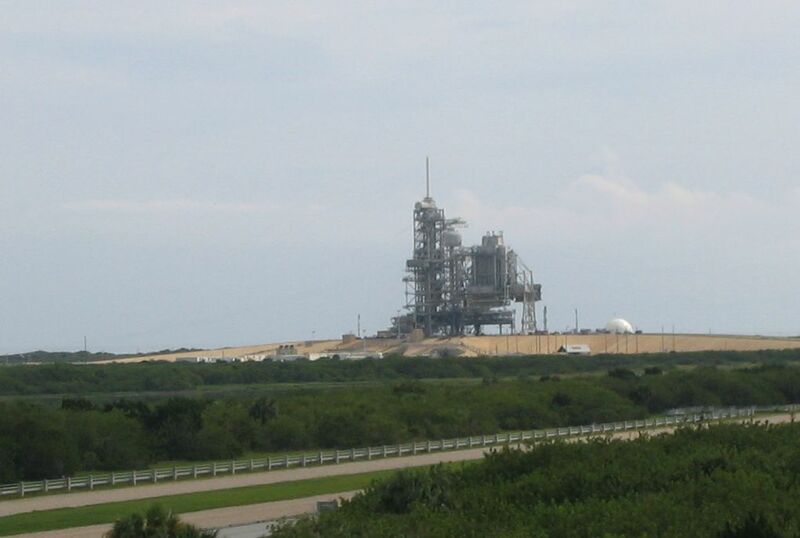 So much of our nation's proud history is associated with that launch site. May God bless Discovery's crew and bring them safely home again. The L.A. Times' columnist Joel Stein proves once again that, at best, he's immature and at worst...well, you fill in the adjective. "So the reason I didn't want to put a flag outside...was because I didn't want to associate myself with the other people who put them up, and with their unquestioning, tribal, us-versus-them, arrogant mentality." Stein isn't amusing, and he certainly doesn't have any interesting insights to share with the rest of us. How does someone like this rate a job at a major newspaper? Then again, this is the paper that finds it "patriotic" to publish details about classified programs which protect our country, so perhaps the paper's choice of inspirational op-ed reading for our country's 230th birthday isn't surprising. 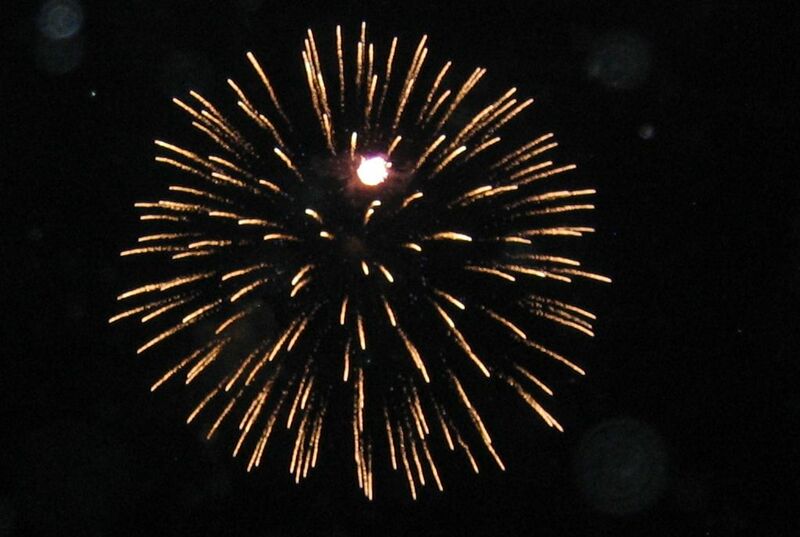 Myrna Blyth shares her memories of past Independence Day celebrations in National Review. Taking a page from Myrna...my earliest memory of the 4th is of hiding under the kitchen table because I was afraid of fireworks. :) That fear didn't last long. We live in a city where street fireworks are still legal, and I have to admit I love them. There is something about the smell that says "Independence Day" to me like nothing else. 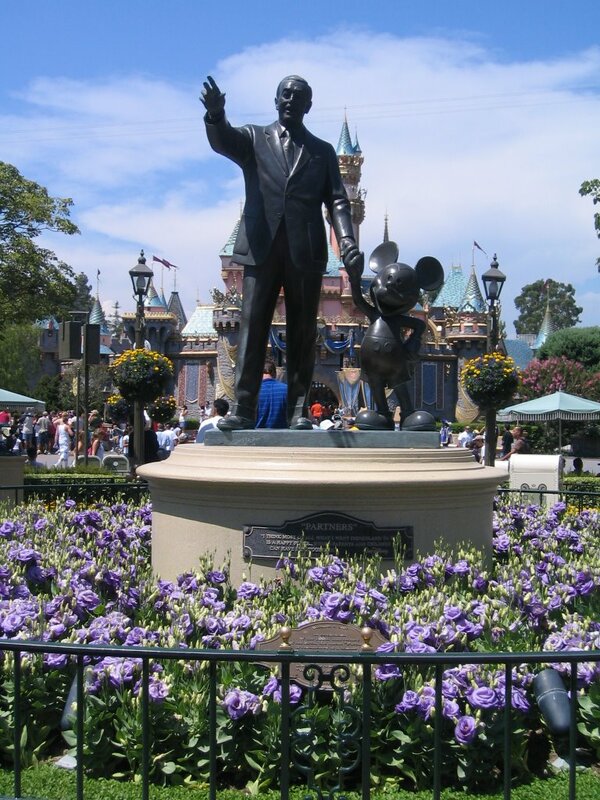 During my college years I spent some Independence Days working at Disneyland, one of its busiest days of the year. I especially loved Electrical Parade duty -- each restaurant and attraction would send a Cast Member to help with parade security, which meant that the parade route was staffed with CM's in every kind of costume imaginable. It was also a great spot from which to see Disneyland's "Fantasy in the Sky" fireworks. In more recent years, I've sometimes spent the night of the 4th sitting on our roof with our children, from where we can see Disneyland's fireworks! We hope to celebrate Independence Day in Bridgeport again soon. Our country was blessed with a remarkable group of Founding Fathers, but I particularly believe that it was Divine Providence who placed this "Indispensable Man" in the right place at the right time in our nation's history. Abraham Lincoln is debatably George Washington's equal in greatness, but without President Washington, it's unlikely there would have been a United States in existence for President Lincoln to save. The Supreme Court granted a temporary stay today preventing the removal of a cross from the war memorial at Mount Soledad in San Diego. Captain's Quarters has the details. This gives new hope to those fighting to save the cross. This case is certainly a prime example of the extremism of the far left, who fear the slightest hint of religion on public land, even as part of a war memorial. July 8 Update: Yesterday the Supreme Court extended the stay until all legal appeals are exhausted. When it comes to duplicity and lack of seriousness about our nation's security, The New York Times is the gift that keeps on giving. As mentioned previously, the Times editors and writers now can't seem to quite make up their mind whether they have a scoop about a "secret," "classified" program or have a front page non-story which was "by no means a secret." That's what happens when you lie, as the Times people have been doing to try to keep from being investigated -- you have a hard time keeping your stories straight. They wanted the scoop for the sake of headlines, selling papers, and winning Pulitzers; they want a no-big-deal non-secret in order to stay out of hearings, courtrooms, and jail. Patterico has excellent analysis above and here; Post Watch has further commentary. Expose the Left has video of Bill Keller's appearance on Face the Nation. (Why am I not surprised that Keller went to CBS for his only Sunday appearance?) Keller made some remarkable statements; I'm still trying to figure this one out: "If you’re under the impression that the press is neutral in this War on Terror, that we’re agnostic, and you could get that impression from some of the criticism, that couldn’t be more wrong." Earlier this week Scott Johnson of Power Line theorized that although Keller was acting quite stupid, he probably really isn't. After checking out his Face the Nation appearance I think we can safely say: Keller really is that stupid. And unfortunately this unelected, not-very-intelligent man is holding our national security in his hands due to a belief that the media has a special right to declassify and publish top secret information. Keller is under the delusion that somehow he and his paper are protecting our nation from a President he despises, but the reality is that due to Keller's publication of leaked information, everyone in the United States is now in increased danger. Hugh's blog, now affiliated with Town Hall.com, will re-launch on July 4th. You've got to love this AP story about today's Mexican election which states many Mexican voters who are in the U.S. illegally "were disenfranchised by their fear of crossing the border as undocumented residents." There was also the problem that Mexican citizens living in the U.S. had to apply for a new voting card in Mexico, "a risky chore for an illegal immigrant." Then there's an illegal alien who wants the new Mexican president to "fight for rights for Mexicans"...in the United States, not Mexico. "We're always fighting hard to make it, but we've been living under more pressure, more strain." Maybe the new Mexican president should fight for the rights of Mexican citizens in Mexico. Cleaning up government corruption would be a start. Can you imagine if the situations in this story were reversed? Would we be reading a sympathetic story about "disenfranchised" Americans living illegally in Mexico? I think not. One of the things I particularly enjoy about NASCAR is the unabashed patriotism and support for our troops. This aspect of NASCAR is especially apparent at the Pepsi 400 at Daytona, which is traditionally held near Independence Day, and today was no exception, as Vice President Cheney stopped in for a visit. It made a wonderful picture as the drivers in their colorful uniforms lined up behind the Vice President while he made a brief speech as part of the pre-race ceremonies. The V.P. also attended the drivers' meeting, where he thanked them for their support of our military. Sunday Update: Scroll down through the first couple dozen posts of this Free Republic thread for some great photos of the Vice President's visit to Daytona. Bill Keller and Dean Baquet, Executive Editors of the New York Times and Los Angeles Times, are coming across as rather desperate as they team up and attempt to defend themselves -- again -- in "When Do We Publish a Secret?" Extensive analysis from Patterico's Pontifications here. Keller simultaneously proves his disdain for our nation's leaders by publishing extensive details about Vice President Cheney and Defense Secretary Rumsfeld's weekend getaway homes, right down to the location of a security camera. Power Line has further details. Small wonder that, as Captain's Quarters notes, new polling data is looking good for Republicans and bad for the mainstream media. The MSM's utter contempt for our country has been all too apparent of late. Sunday Update: More from Michelle Malkin under "The Blabbermouths Backpedal." Funny how the NYT is simultaneously claiming that "everyone knew" about the SWIFT program yet at the same time say it's a major scoop about a "closely held secret." Scott Johnson of Power Line asks Keller and Baquet "Who Died and Left You President?" and notes that the editors "claim a plenary power that places them beyond the reach of the criminal laws of the United States." Johnson responds: "The proposition that the Times Two have a right to disclose classified information subject to the Espionage Act is no more true of the Times Two than it is of any other citizen whose right of free speech is protected by the same First Amendment that protects the Times Two."